The history written by the French is not right. They state that they invaded North Africa, once on the grounds of wanting to end pirate actions in the Mediterranean, and once because the French consulate would get slapped in the face by the Turkish dey. The Consulate which was the lover of the Turkish dey. All this is nothing but bogus. The only reason that the Turks didn’t defend themselves against attacks from the French, was that the two nations, for several centuries, were allies against North Africa. The golden age of the Ottoman empire was at its end. The Kabylians were ready to rule North Africa, the way the American consul William Shaler wrote in his book « Sketches of Algiers« ,Kabyle people he describes as being fanatic of equality and freedom . France would never allow their enemies of centuries (Kabylians) to rule the south of the Mediterranean, which is the real reason for France to invade North Africa. The summits of the mountains quickly took on the charming rosy hues of the dawn, which soon lit up the valleys and plains, as the day grew rapidly. Long lines of Kabylians were seen descending down the paths of the mountain, and hastening towards the city and the batteries. The latter were quickly filled with armed men.They had not other hope than to count on the power of surprise, and they realized that it was essential to take the position by force. The previous year the sailors of the Béarnaise had visited Bougie and its annexes, as mentioned. A few months later, the Duke of Rovigo sent some faithful Moors and Captain Lamoriciere to this very town, on some pretext, but in fact to study the area. 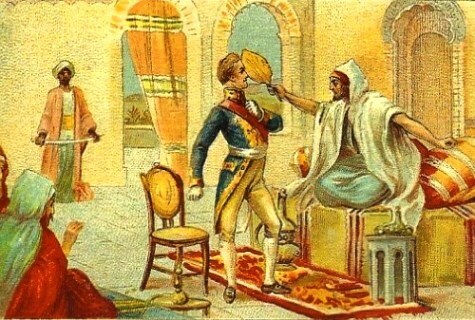 The Turks and other Moors had not been too hostile against the French, which was unlike the Kabyles who descended from the mountain wanting to massacre them. The French managed to escape with great difficulty. However, this short time was enough for Lamoriciere to draw a rather exact sketch of the area. The Bougie Bay, which we have already mentioned, is entirely dominated by the high peak of the Gouraya, forming Cape Carbon, from which the view extends far into the distance. As soon as the Victory ship, which was marching the squadron, was within range of the enemy cannon, it had to bear the fire of the forts and batteries. However, the shots were badly aimed and caused little damage, and did not by any means prevent the ship from anchoring quietly at half-past six in the morning, and tightening its sails. When it did so, it opened fires and splits 300 meters from the coast. Meanwhile, the other ships, still with its sails raised, then reached the anchorage assigned to them. After a few minutes the enemy batteries were silenced. The captain then signaled all the vessels to disembark. Barges loaded with infantry troops and towed by canoes advanced rapidly towards the triumphal arch (tawwurt llevh’ar) which adorned the beach, under the protection of armed canoes at war. These troops were met by a rolling fire of musketry, which begun at a hundred paces distant. Those who produced it, staying perfectly ambushed remained almost invisible. However, they were seized by the artillery of two of the buildings. From the squadron nothing was visible of what was happening, because of the intensity of the smoke. But as soon as it dissipated, we distinguished our soldiers who had captured the two hillsides overlooking the triumphal arch. Lamoriciere, along with 200 men, advanced forward, and taking advantage of the disorder which reigned among the Kabyles, he managed to reach the foot of the old city whose door had remained open. The main positions had been occupied rather briskly, but the Gouraya and the city still held. The Kabyles descended from their mountains into the city, where each house would become a small fortress. A beautiful Kabyle woman, carrying a flyssa in her hand, encouraged the Kabyles to defend the city. Everywhere, the enemy, cleverly clutching behind the walls and the neighboring escarpment, shot everything that appeared in the open. The fight was violent and obstinate. It became impossible for the French to advance. Occasionally the artillery of the squadron found a favorable opportunity to launch some projectiles on a certain point with little certainty of reaching the French, and the combat had degenerated promptly into a series of particular struggles, in which each one acted their best, but on their own. Here, soldiers were attacking houses whose doors had to be kicked down, when one could approach it; and then all the men, women, children, who were there, were brought to arms, and then the provisions that came to hand were eaten. There, we fired with rage in order to gain a few meters of the field which was very difficult. Elsewhere, there were obstinate Kabylians who managed to take back houses that had been taken away from them. In the midst of this confusion, the officers no longer knew where the soldiers from their respective companies were located.